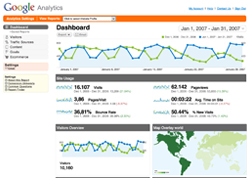 TechWyse is pleased to announce its increased efforts in raising the communications bar in online marketing. Firstly, TechWyse is pleased to announce its first facelift to their online blog since its inception in January of 2007. 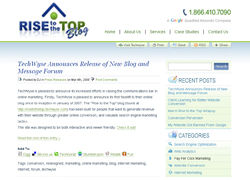 The “Rise to the Top” blog (found at https://techwyse.com/blog) has been built for people that want to generate revenue with their website through greater online conversion, and valuable search engine marketing tactics.The site was designed to be both interactive and viewer friendly. Check it out! TechWyse is also pleased to announce the launch of its new online forum, built to discuss the latest in internet marketing experiments, innovation and search marketing. “We have quickly found that this forum has become a great place to bookmark useful sites that we do not want to be forgotten. As a company we use this regularly and we feel that it would provide a great deal of value to external internet marketers that also may want to read and contribute,” said TechWyse CEO Daryl Kennedy. The recently redesigned forum can be found at www.wyselabs.com/marketinglab. 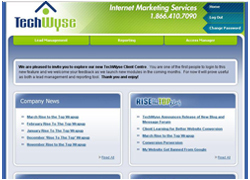 TechWyse is a proud supporter of the internet marketing industry and an advocate of web usability and website conversion. The latest release of the ‘Rise to the Top’ Blog and the ‘WyseLabs’ online marketing forum is a testament to this. Your online forum has a well thought out plan. It’s s a good platform to share ones’ online ideas, innovations and achievements. It is educative as well and will definitely help internet marketers like me with relevant, useful information. Thanks for the helpful tool! Looking forward to seeing the growth of it!